Farmers in a knowledge fair exhibition! Gathering at Luwero district, the CELAC farmers’ knowledge Fair, a yearly event organized by BROSDI in close collaboration with the CELAC Luweero Agricultural Network attracted farmers from the districts of Luweero, Masaka, Bushenyi, Kabale, Tororo, Apac, Sironko ,Manafwa, Kasese, Pallisa Mayunge and Lira, involved in farming of Bananas, Orange Sweet potatoes, Cassava, Tomatoes, millet, Groundnuts, Maize, Irish potatoes, Onions, Green pepper, Chicken, Turkey and goats. From the look of things, this was to be a very successful event. On the eve of the event, farmers gather at New Eden Primary school in Luweero district, where the event is to take place the following day. These were to become the attention-grabbing activities of the day. Next step is to set their stalls. As they set up their stalls, we realize that some items are missing! So we rush to the nearest town to buy some masking tape, glue and a piece of white cloth for the power point presentation. Ednah had suggested we present photos that were being taken during the event and also old photos that had been taken during field visits by Maria, the CELAC program Coordinator. The idea behind this is that such technologies excite farmers and rural folks as Ednah the Managing Director of BROSDI reveals to us and indeed it does as we later found out. Having acquired our items, we rush back to the exhibition venue to finalize our setup. Having done all these, the event is set to begin with a debate first on the agenda. Tapping on the theme of the event, “the role of Mobile telephony to grassroots farmers in rural Uganda”, farmers had prior to this activity divided themselves according to those who were for mobile phones and those against them; and they were ready to present their case! Having successfully presented their case and since there is no judge to rule out who has won the debate, next on the agenda is the mock radio program. Here farmers discuss issues agreeing and disagreeing that the grassroots farmer was meant to remain poor. This is followed by the knowledge sharing forum, where farmers are taught on how to host successful knowledge sharing forums. Amidst these activities, other farmers are busy exhibiting products on their various stalls. On visiting these stalls, farmers are demonstrating how to grow a certain crop right from the nursery bed to the final product even exhibiting the various products got from these crops and animals. 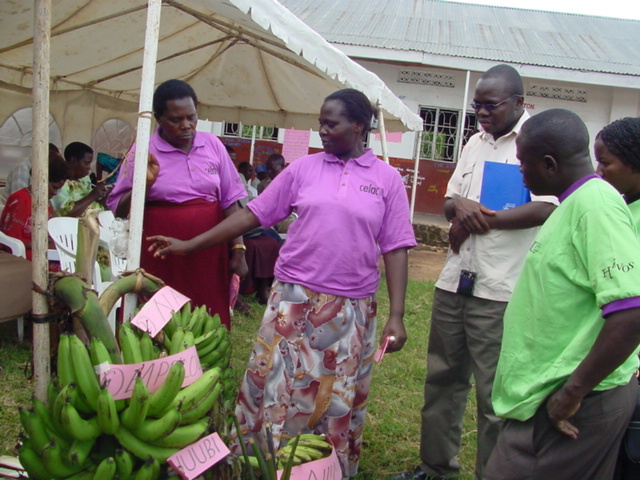 The most interesting stalls to visit were banana (matooke) growing from Masaka, growing of Millet from Bushenyi district, Orange sweet potatoes from Luwero district, who later won prizes for the best exhibitors respectively. The most fascinating facts were the way these farmers diversify their crops to expand their income generating base. We learn that with the orange sweet potato one can bake cakes and doughnuts from the sweet potato flour, in addition to making bathing soap and Vaseline out of it! On deep interaction with other farmers, their appreciation for the role of CELAC project in helping them achieve their dreams through the use of mobile phone messaging to get market prices, use of the radio programmes and the literature given to them inform of how to guides can not be denied. However, their main concern now is the need to access markets where they can sell their produce as they are being cheated by the middlemen. This is one thing perhaps the CELAC project needs to look at since it has promoted knowledge sharing for the farmers and as such they have been able to increase their produce. The next step should be to provide them with market opportunities to sell their produce! Summing up the event are speeches from special invited guests and the awarding of certificates and prizes to the best exhibitors. While presenting the prize to the best exhibitor, the LC5 of Luwero district who happened to also be the guest of honor, urged farmers especially women to indulge in income generating projects such as the CELAC project so as to get exciting opportunities such as the one got by the farmer who was invited to Italy to participate in Cheese making workshop. Masaka district won a fully connected village phone as the best exhibtors, followed by Bushenyi district who won three hoes and three pangas; and Luwero district who won two hoes and three pangas. However, a certificate of participation is given to all participating districts. On this note, since most farmers put in a lot to participate in this event, it would be nice if CELAC provided a prize for each district so that the farmers do not lose hope. This entry was posted on May 2, 2007 at 3:25 pm and is filed under Farming section. You can subscribe via RSS 2.0 feed to this post's comments. You can comment below, or link to this permanent URL from your own site. This is a blow-by-blow account of what happened. Is there any lesson you drew from this event that you would like to share? How different was it from that of last year? Was this particular one well organised? Did you get the farmer’s views about this event, whether it met their expectations if they had any? What were our expectations anyway? Why did we choose the theme around the mobile phone? Nice questions you have raised Abu! 1. Is there any lesson you drew from this event that you would like to share? Yes, I think this is covered this in paragraph 10, when i talk about the way these farmers diversify their produce to make other products like cakes, dougnats, soap and vaseline!! Something that I found quite interesting!! Our expectations were to get the farmers familiarise with each other as well as for them to meet other farmers at the same time expand their market base and i think this was achieved. We chose the theme around the mobile phone simply because this the main gadget used by the CELAC project as a means of communication with the farmers as far as knowledge sharing is concerned. That explains why the activity of the debate on whether mobile telephones have improved the lives of the rural grassroots farmers was carried out and some of the differing views have been given. 1.To enable farmers to explore new market opportunities for their products.Atleast we were able to invite a few buyers from Kampala who attended the fair,and were able to contact farmers as the major producers. We were also able to get phone contacts of the leaders of market vendors who are willing to connect farmers to major genuine buyers who asured us of ready market in Owino of all crop types produced.These contacts were put up on the day’s notice board and farmers were able to copy the numbers. o The projector and the I river which most of them had never seen before.And by the end of the day we expect to put the voices recorded on CDs so as we give them out to different district networks for learning purposes. 3.To enable the farmers have face to face discussions with fellow farmers from other districts.Which we achieved and by now the farmers know each other and are able to contact each other on phones for extra farmer to farmer advice. 4.To encourage the farmers have a sense of competition so as they can realize better quality and more produce.This was witnessed when every district laboured to be the winner of the day and those who all along thought were the best realised there are better farmers than them and they all promised to work even harder. Farmers wrote their views on the noticeboard about the event and will be up soon at the CELAC website. Another reason for chosing the theme of the mobile phone is because its one of the cheapest medium of communication farmers can use to access market information and knowledge sharing.We wanted them to learn more about how they can use phones for improved livelihood.From the debate,they learnt alot about them,moreover it was led and conducted by farmers them selves.